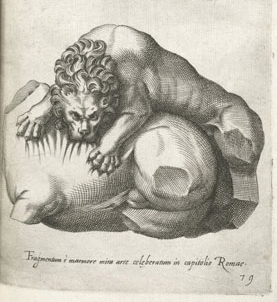 In 1594 Ruggero Bascape, a student of Michelangelo, added the horse’s head, legs, and tail, as well as the lion’s rear legs. (Capitoline Museums description). Usually dated to the late 4th century B.C., the animal group of a lion attacking a terrified stallion was probably made in northern Greece or Asia Minor. As Rome extended its dominion over the neighboring regions, valuable art was seized as spoils of victory and sent back to the capital. Reportedly found in a streambed below the Palatine Hill, near to the Circus Maximus, where it was likely displayed in antiquity.